Hobbs Tuscany Cotton Wool Batting is a wonderful blend of 80% fine cotton and 20% superwashed wool. It is designed for hand quilting, as well as for machine and long-arm projects, and resists bunching and fiber migration. The addition of the wool adds a wonderful loft, which gives greater detail to the stitching pattern, and the wool also lends a nice drape and softness without the stability of the batting being compromised. Hobbs Tuscany Cotton Wool Batting is perfect for bed quilts and as a second layer of batting (behind Hobbs’ Tuscany 100% Wool Batting). 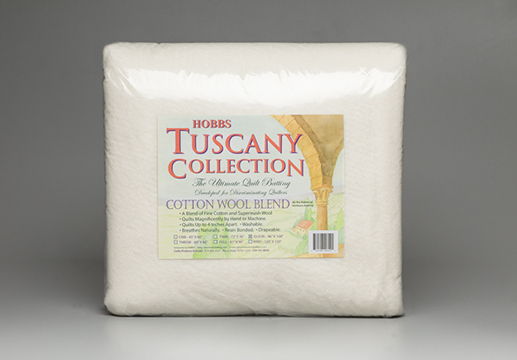 Hobbs Tuscany Cotton Wool Batting is specifically designed to be used with medium or dark-colored fabrics. If used with white or very light fabrics, the wool and unbleached cotton can slightly darken the light colors. Quilts with this blend of fibers can be washed many times and will get softer over time. Gentle machine washing (in cool water and on a delicate cycle, with no heavy agitation or spinning) and air drying are suggested. Quilting/stitching should be every 4″ inches, or closer, and quilters may experience shrinkage of 3-5%. We recommend quilters spend time learning about this product before using it on a project – making samples using this batting to see how it needles, both by hand and by machine, and how it launders provides an opportunity to see if this batting can deliver the desired results. Pre-washing is not recommended for this or any of our other quality batting products.